Europa Occidentalis initio belli successionis Hispanicae. Europa Occidentalis anno 1714, post foedera Traiecti ad Rhenum et Rastattense. Allegoria Pacis Rheno-Traiectinae. Pictura Antonii Rivalz. Pax Traiecti ad Rhenum, vel Pax Rheno-Traiectina, est series foederum pacis quae a belligerentibus in bello de successione Hispanica—a regnis Hispaniae et Franciae ex una parte et Britanniae ex altera—Traiecti ad Rhenum in urbe Nederlandica inter die 11 menses Aprilem 1713 et 13 Iulium 1715 signata sunt. Quibus foederibus bellum compositum est. Philippus V rex Hispaniae acceptus est. Philippus V successionem regis Franciae recusavit, principes Franciae successionem regis Hispaniae. Ita constitutum est, ne umquam Francia et Hispania uno rege coniunctae essent. Hispania Imperium suum cepit, sed Nederlandiam Hispanicam, Regnum Sardiniae, Ducatum Mediolanensem atque Regnum Neapolitanum Imperio Romano Sacro cessit. Sicilia insula ad Ducatum Sabaudiae pervenit. Britanniarum Regnum Gibraltar et Minoricam insulam accepit. Francia colonias in America Septentrionali (quae erant Terra Nova, Nova Scotia, Novum Brunsvicum) Britanniarum Regno tradidit. Churchill, Winston. 2002. Marlborough: His Life and Times. Sicagi: University of Chicago Press. ISBN 0-226-10635-7. Editio imminuta interretialis. Dadson, Trevor J., et J. H. Elliott, eds. 2014. Britain, Spain and the Treaty of Utrecht, 1713-2013. Londinii: Legenda, Modern Humanities Research Association and Maney Publishing. ISBN 9781909662223, ISBN 1909662224.
de Bruin, Renger E., Cornelis van der Haven, Lotte Jensen, et David Onnekink, eds. 2015. Performances of peace: Utrecht 1713. Lugduni et Bostoniae: Brill. ISBN 9789004304772. Falkner, James. 2015. The War of the Spanish Succession 1701–1714. Barnsley, South Yorkshire: Pen and Sword. ISBN 1781590311, ISBN 9781781590317. Frey, Linda, et Marsha Frey, eds. 1995. The Treaties of the War of the Spanish Succession: An Historical and Critical Dictionary. Westport Connecticutae: Greenwood Press. ISBN 0-313-27884-9. Summarium interretiale. Gregory, Desmond. 1990. Minorca, the Illusory Prize: A History of the British Occupations of Minorca Between 1708 and 1802. Associated University Press. Ieva, Frédéric, ed. 2016. I trattati di Utrecht: una pace di dimensione europea. Romae: Viella. ISBN 9788867284313. Klinkhamer, Sibout Cornelis. 1829. De bello propter successionem regni hispanici gesto, pace rheno-traiectina composito. Amstelodami: typis C. A. Spin. Lesaffer, Randall. 1914. The peace of Utrecht and the balance of power. Oxford Historical Treaties, 10 Novembris. Lynn, John A. 1999. The Wars of Louis XIV, 1667–1714. Longman. ISBN 0-582-05629-2. Mowat, Robert Balmain. 1928. 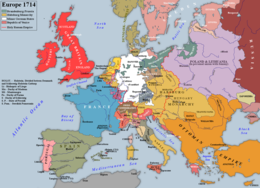 History of European diplomacy, 1451–1789. Textus interretialis. Sichel, Walter. 1901–1902. Bolingbroke And His Times. 2 vol. Vol. 1 The Reign of Queen Anne. Stanhope, Philip. 1870. History of England, Comprising the Reign of Queen Anne until the Peace of Utrecht. Londinii. Trevelyan, George M. 1930–1934. England Under Queen Anne. 3 vol. Londinii: Longmans, Green and Co.
Vide Textus foederis apud Vicifontem. Novissima mutatio die 11 Aprilis 2019 hora 15:40 facta.